Most price targets of each market have been met. The gold and silver markets together with gold mining stocks started to have bullish reversals last week. 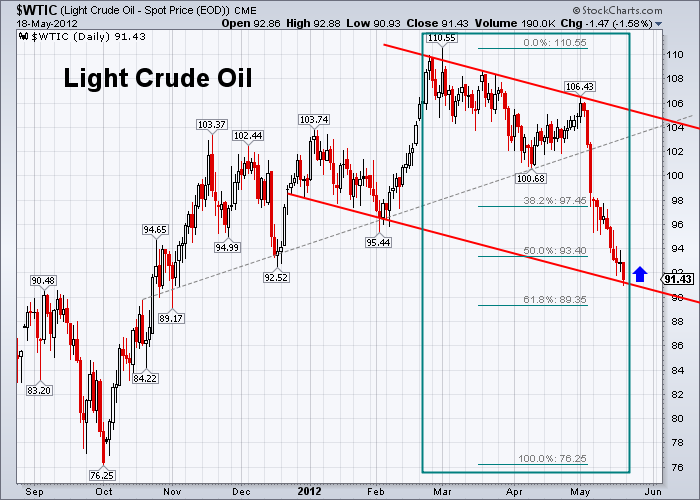 It could be a sign for a possible bullish reversal of this commodity-driven and oversold market. As projected early, the bearish time-window for the broad stock market should end on Monday, 5/21/2012. After it completed a three-month Ascending Broadening Wedge pattern, the S&P 500 index has reached the downside price target of 1325. So far the SPX has retraced about 38% of the previous uptrend measured from the low of last October to the high of this April. Now the daily chart of the SPX is gradually forming a new Descending Broadening Wedge pattern (see here) confined by two down-slopping diverging trend lines. The main characteristics of this pattern is that the volatility dramatically increases with a series of up-and-down high-waves of price movement. Last Friday the downwave approached the lower boundary of the wedge. It comes to a critical point to check whether or not the broad market is able to have a technical rebound from here. 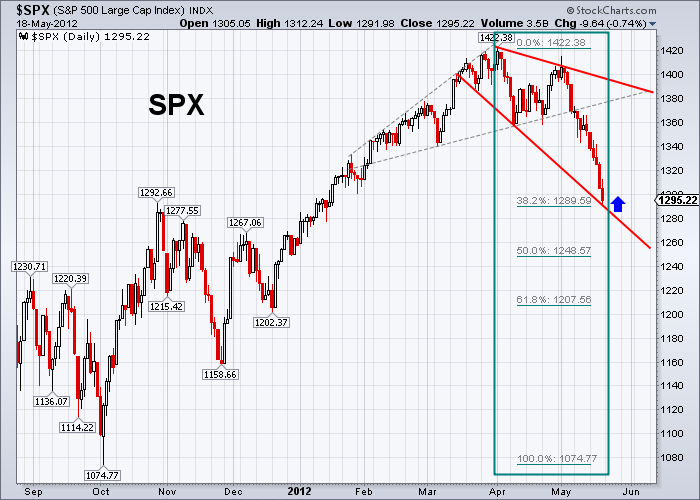 If it does, a rebound could be explosive towards the upper boundary of the wedge for a market recovery. 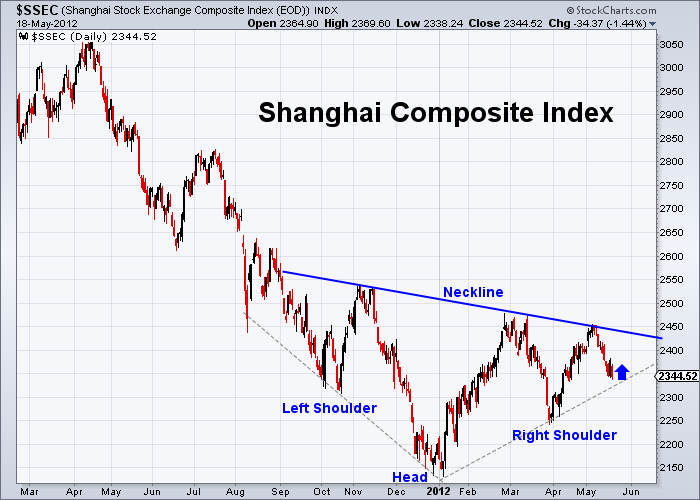 The Shanghai Composite Index is still in progress of forming a possible inverse Head-and-Shoulders pattern. During this down turn of the global stock markets in last three weeks, the foreign markets performed much worse than the U.S. market. However, the Chinese market performed better than the U.S. market (see the BRIC market performance table on the bottom of this page). If the global stock markets have a technical rebound, the Chinese market could break out from its inverse head-and-shoulders pattern. 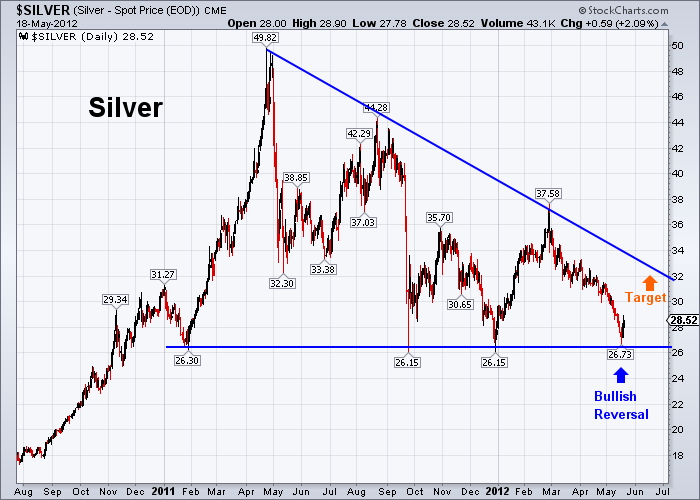 Such a bullish breakout of the Chinese market may support a bullish reversal of gold and silver. The gold index has been in an intermediate-term “Bump-and-Run Reversal Top” pattern (see here). Currently it is below the “Lead-in Trendline” and it is in the “Run” phase. The typical characteristics of the “Run” phase is a downhill run for price movement. 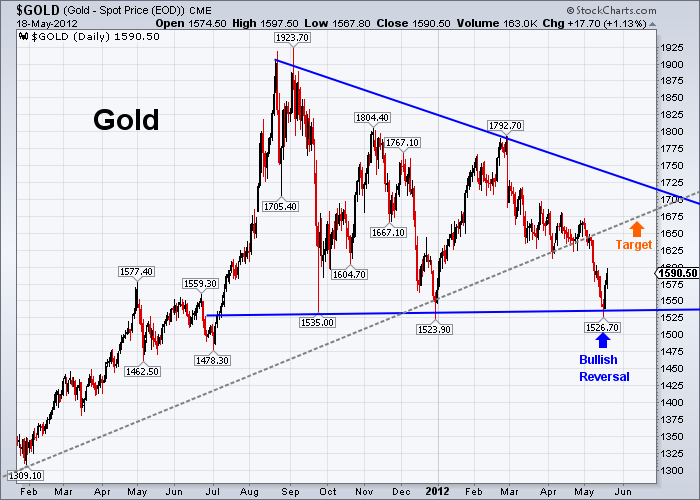 Last week gold had a bullish reversal after it found a support from the target line very near the price target of 1525. How will this rebound go? 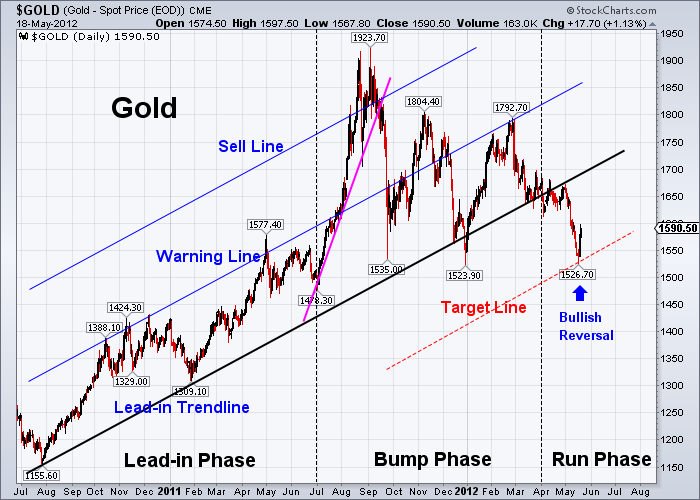 Please read the next section about a short-term assessment of gold. The gold index has formed a Descending Triangle pattern (see here) with a falling resistance line and a horizontal support line. The descending triangle generally appears in downtrends. Price movement is choppy between the two boundary lines before a breakout from the either side of the triangle. Last week gold had bullish reversal from the horizontal support line of the triangle. It may start an upswing towards the lead-in trendline which mentioned in the previous section. The upside price target is projected at 1675 near the resistance from the lead-in trendline (the gray dotted line). Since April of last year, the silver index has formed a Descending Triangle pattern (see here) with a falling resistance line and a horizontal support line. Last week the downswing reached the lower boundary of the triangle near 26.50, and had a bullish reversal. 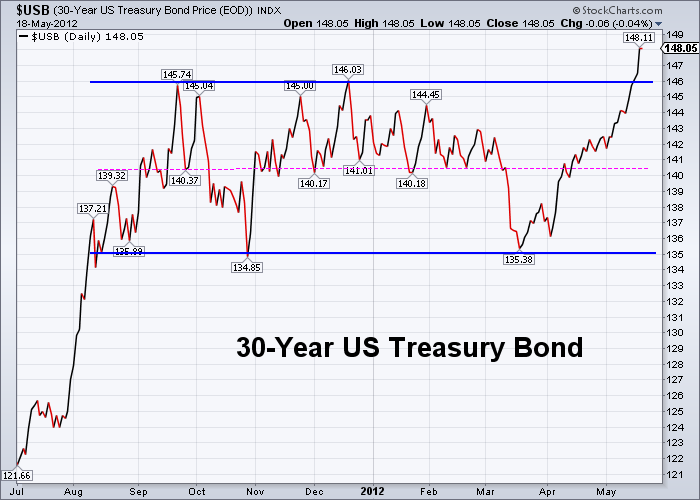 The next upside price target is projected at the upper boundary of the triangle near 32. 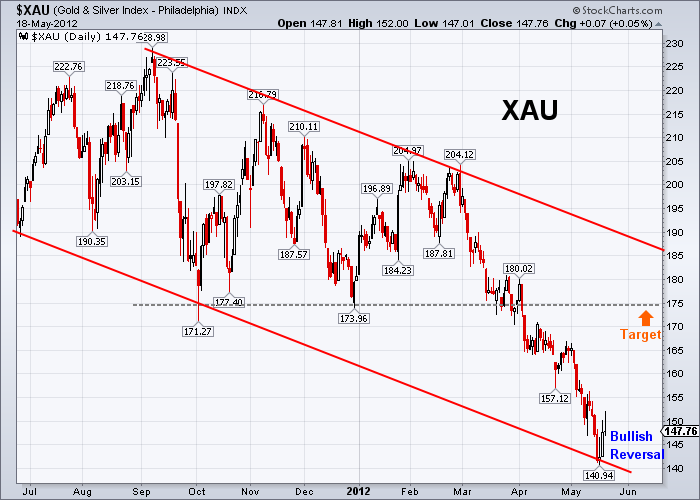 Both XAU and HUI last week reached their downside price targets which I projected on 4/7/2012 from the 7-month descending triangle patterns. Now they are forming downtrend channels, but have bullish reversals at their lower trend lines. The upside price targets for this counter-trend move are projected at the resistance from the horizontal lines of the previous descending triangle patterns, i.e., 175 for XAU and 480 for HUI. The crude oil reached the downside target of 92.50, and retraced over 50% of the previous uptrend measured from the low of last October to the high of this March. 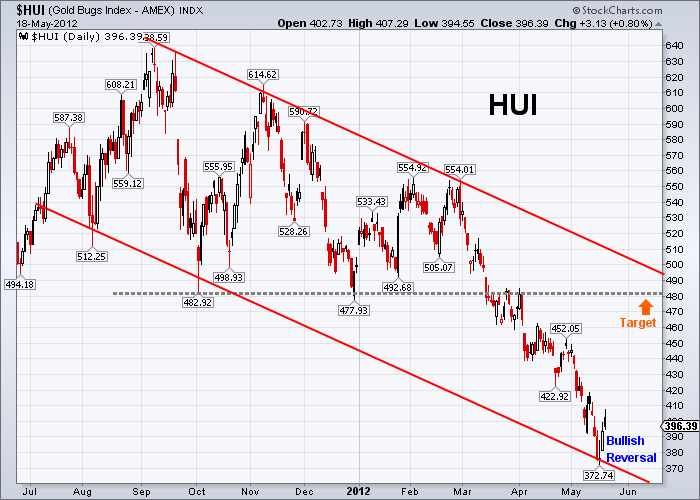 Now it forms a possible downtrend channel, and looks for a bullish reversal from the support of the lower trend line. 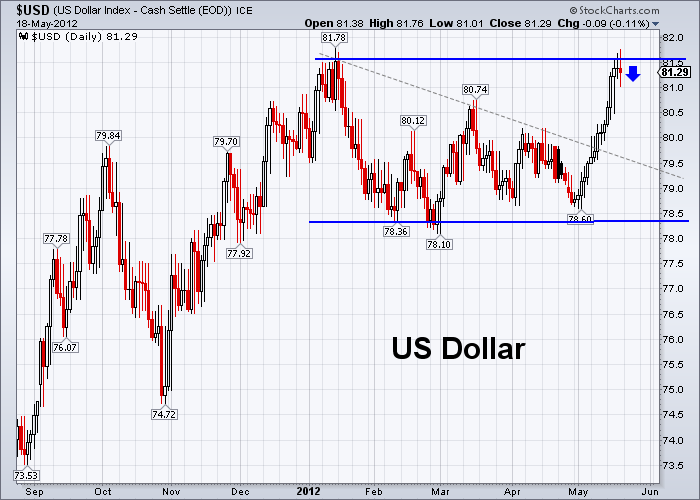 The US dollar index reached the upside price target at 81.50. It may have a bearish reversal here to form a rectangular pattern. The 30-Year US Treasury Bond index broke out from the upper horizontal resistance line of the 9-month rectangular pattern, and made a new high over 148. The following table is the percentage change of sectors and major market indexes against the 89-day exponential moving average (EMA89). 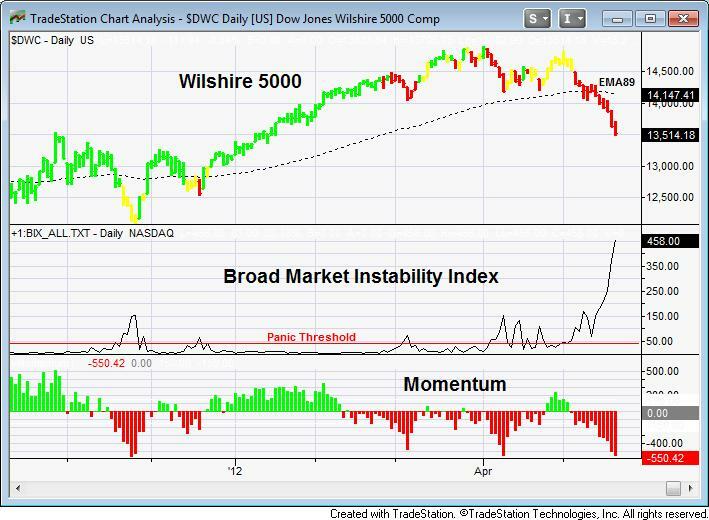 The Dow Jones Wilshire 5000 index, as an average or a benchmark of the total market, is 4.48% below the EMA89. Outperforming sectors are Telecommunication (3.77%), Biotech (3.07%), and Pharmaceuticals (0.52%). 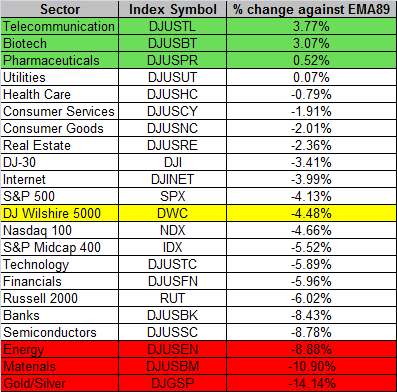 Underperforming sectors are Precious Metals (-14.14%), Basic Materials (-10.90%), and Energy (-8.88%). The Dow Jones Industrial Average (-3.41%) is outperforming the market, and the Russell 2000 Small-cap (-6.02%) is underperforming.